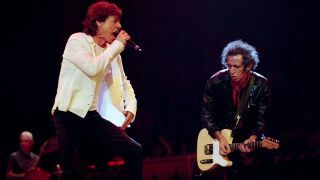 The Rolling Stones have released a video of their performance of Honky Tonk Women from 1999. The clip has been selected from the band’s latest From The Vault release titled No Security: San Jose ’99. The DVD, Blu-ray, DVD/2CD and 3LP launched on Friday and captures the Stones as they toured the US on the back of their Bridges To Babylon album. A statement reads: “No Security captures a stand-out Stones show, with the band on searing form during the closing leg of their American tour in San Jose. “The setlist spans from the mid-60s hit singles to the Bridges To Babylon album, including a bluesy, dramatic version of Midnight Rambler, a dark and swaggering Out Of Control and the rarely performed live Some Girls and Saint Of Me. No Security: San Jose ’99 is now available to buy. Find further details below.